It seems the first half of the year was marked by multiple episodes of unpredictable weather across the United States. The same could be said of the economy. Another disappointing First Quarter showed real GDP growth of just 1.1% (although this was revised upward from the initial estimate of 0.5%). Private sector economists still anticipate that the pattern of a second half rebound will hold again in 2016, and the outlook for growth in 2017 remains above 2.0%. Jobs. 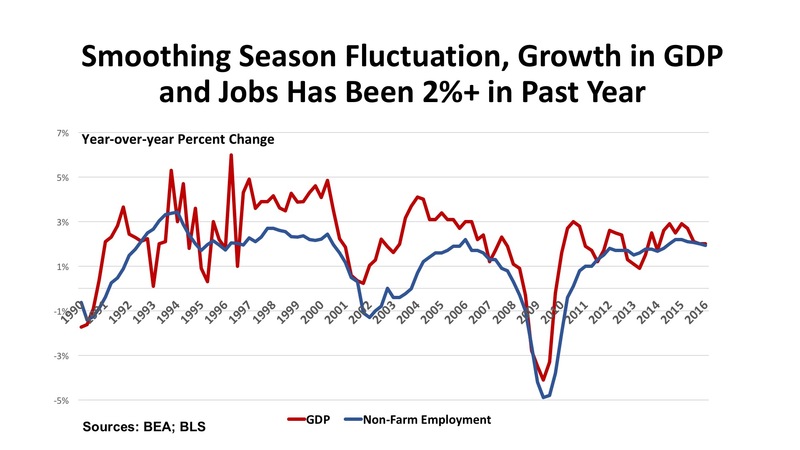 Employment growth slackened in the Spring. The May jobs estimate was especially weak at just 11,000. But then the June figure came in with a robust gain of 287,000. Most industries have been stable to slowly growing over time, but the temporary adjustment of 35,000 jobs due to the Verizon strike (counted as job losses in May and gains in June) skewed the month-to-month change. Year-over-year, net job change was up 2.45 million, or 1.7%. Total employment hit a new high for the U.S. at 144.1 million, up 10% from the trough of the Great Recession and 4% higher than the pre-recession peak. The unemployment rate, meanwhile, stands at 4.9%, and the consensus of economic forecasts anticipates a further, albeit slower, decline in the jobless rate for the next 18 months. Policy. Of course, the shockwave of the Brexit, the United Kingdom’s referendum vote to leave the European Union, was yet another unexpected jolt in late June. The financial markets plunged as a result, but had largely recovered their losses by July 1 and achieved new historic highs thereafter. Volatility, however, appears to have put on hold any near-term increases of interest rates from the Fed. Uncertainty in Europe may be increasing the flow of “flight capital” into the U.S., and into hard assets like real estate. Based on past experience, New York is likely to receive a disproportionately high share of any capital seeking safe-harbor in the United States. What could compromise this outlook? Concerns that the U.S. will retreat from its evolving engagement with the global economy in a world that is ever more integrated in merchandise and services trade, and capital flow. The disputes between the European Union and Great Britain will appear puny should the U.S., the world’s largest economy, retreat from its cross-border business engagements. The Outlook. Several fundamental indicators recently released suggest that the national economy should be resilient through the coming months. The Case-Shiller Home Price Index is up 5.0% for the year, which should translate into improving consumer sales. Wages are moving up modestly, exceeding the 1.1% annual inflation rate that is well below the Fed’s target. The dollar has continued to strengthen, though, which will retard GDP growth by widening the balance-of-trade deficit. All economic news will be amplified, good or bad, by the political megaphones of this year’s extraordinary Presidential race. Claims to authoritatively interpret the numbers by either camp should, to put it mildly, be taken with a very large grain of salt. The vast spaces of the Western states create at least one (perhaps) surprising result. In terms of the total number of jobs, the West ranks third with 32.7 million, compared to the Central region’s 55.6 million and the East’s 54.2 million. This is the case even though California is the nation’s most populous state, and has the highest number of total jobs (16.4 million – Texas is second at 12.0 million). But the West need not blush about its employment record. It has the highest job growth rate of the regions: 2.6% in the past year, versus 1.7% in the East and 1.1% in the Central states. Most states in the region (excepting Alaska and Wyoming) are creating jobs, often at a pace well ahead of the nation. In fact, four states (Idaho, Oregon, Utah, and Washington) have been adding jobs at a rate greater than 3%. Arizona just misses this threshold at 2.9%, as does California at 2.8%. There is considerable economic momentum in the region. 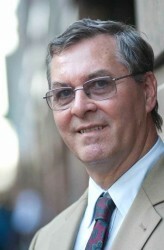 Openness to the global economy contributes to that growth in no small measure. California is the number one import/export state in the country, with $574 billion in international trade volume. That feeds business activity and generates real estate demand in ports from Seattle to San Diego, and supports the growth of the Inland Empire as well. 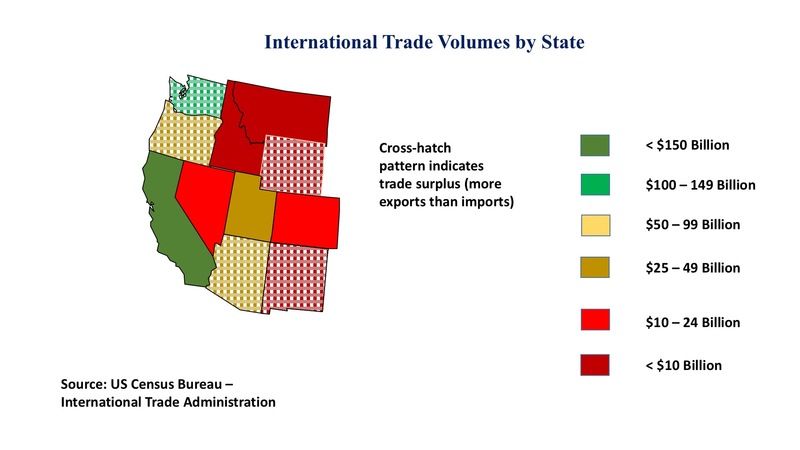 Five states are registering favorable trade balances (more exports than imports), most significantly the State of Washington with a surplus of $35 billion thanks principally to Boeing and Microsoft. Cross-border activity is clearly a beneficial feature of the Western regional economy. Technology industries have been growing so much that limits may be at hand. Demand for cybersecurity professionals, coders, and software engineers is outstripping supply, pushing up wages (and real estate prices) in the Bay Area and other tech hot spots. Ecommerce continues to penetrate the consumer markets, and products from the latest generation of smartphones to the developing “autonomous vehicle” (or “driverless car”) are matters of intense interest throughout the region. Backlogs are reported for orders of commercial aircraft. Tighter financing conditions are having mixed results: demand growth for commercial real estate is slowing and increasing sublease availability. On the other hand, land costs and the difficulty of securing development financing is attenuating the construction cycle, nipping potential oversupply before it becomes excessive. Office. 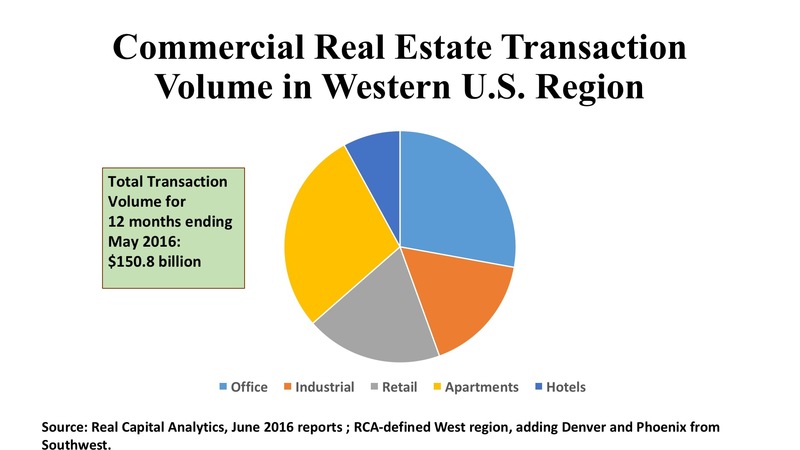 There is a nice symmetry in the distribution of commercial real estate investment in the West. Offices and apartments have a similar share of total dollar volume (about $42 billion each over the past twelve months, or 28% of the regional total for each of these property types). Overall, the West ranks between the East and Central regions in the volume of real estate capital being put into place in the past year. Cap rates in the region are averaging 6.1%, due to the prevalence of suburban sales over CBD properties. Only San Francisco and Seattle see more investment dollars flowing into downtown properties than to offices in the suburban markets. This is true even in Los Angeles. However, blockbuster CBD investments do occur, including the recent sale of 400 South Hope in L.A. for $313.6 million, or $447 per square foot. In San Francisco’s Financial District, 180 Montgomery Street sold for $185 million, or $618 per square foot. A similar price tag could be found ($185 million) for a Bellevue, WA suburban office property, but this equated to $430 per square foot, a strong price in the Seattle metro office market. Industrial. This property sector represents a solid 17% of Western regional acquisition volume at about $25 billion in aggregate price. Flex space accounts for 35.3% of this capital investment, well above the U.S. standard of 27.9% for flex space as a proportion of all industrial sales prices. The highest flex volumes are in San Jose and Seattle, naturally. Warehouse/distribution space dominates elsewhere. For example, the Southern California markets of L.A. and the Inland Empire lead the way with $3.8 billion and $2.5 billion in warehouse deals respectively. Cap rates for warehouses have dipped below 6% on average throughout the region, with only Salt Lake City appearing as an outlier, with a 7% cap rate prevailing. As noted previously, trans-Pacific trade is a true economic engine for the West Coast markets. Hopefully, that engine is not facing excessive political risk in the year ahead. Retail. At $28.8 billion in total acquisition prices, retail accounts for a strong 19% share of the Western regional real estate investment market. Elsewhere, strip center activity dominates, but there is better balance here, with Malls holding their own vis-à-vis neighborhood and community centers in deal count (870 to 743), in dollar volume ($12.6 billion to $9.2 billion), in price per foot ($350 versus $229), and cap rate (5.5% versus 6.2%). Up and down the West Coast the major cities are flourishing, and so shopping centers have a strong consumer base to serve. Big Boxes in the Las Vegas area, a Town Center near Phoenix, and a Nevada Outlet mall all were priced between $235 and $305 per square foot in the Second Quarter. But these prices were eclipsed by strip centers in Thousand Oaks (L.A.) at $838 per square foot, and in Bellevue, east of Seattle, at $745 per square foot. Despite widespread talk about the difficulty of “bricks” in an age of “clicks,” there is no shortage of confidence amongst investors trolling the West Coast for solid assets.